Did you know God loves you so much that he knows you by name? He knows the number of hairs on your head and his thoughts for you outnumber the grains of sand. As a believer, I thought I understood those things. Then, one day, a friend gave me a Bible verse personalized with my name: Kara, listen to me … I have made you and I will carry you; I will sustain you and I will rescue you (Isaiah 46:3-4). That simple slip of paper literally changed the way I related to Christ. In that moment, my heart was awakened to the depth of God’s love for me. It was then that I realized how personal God is! 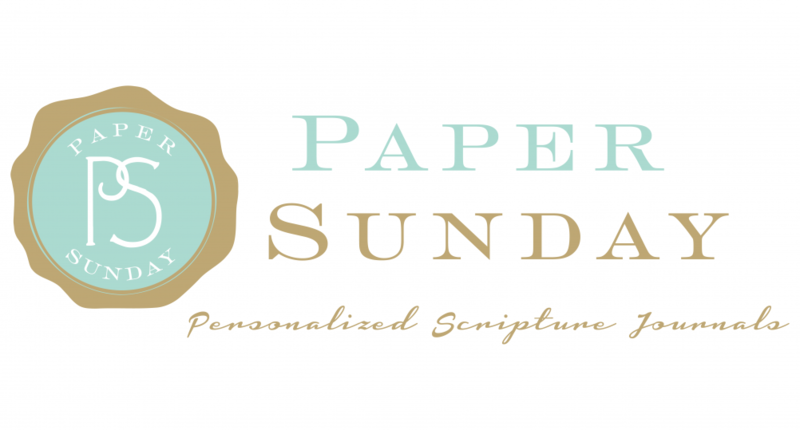 Out of that singular moment (over 10 years ago), grew the idea for Paper Sunday. I wanted others to experience God in that same deeply personal and intimate way. God is real. He is real big, real awesome and real personal, which is why every single one of our journals is personalized with your name in Scripture. Whether you journal or not, our pages can be used as daily reminders of God’s love for you. I sometimes use mine as a “To Do” list, grocery list, or jot down prayer needs for myself and others. And every time I open it, there is a verse with my name reminding me of how much God cares for me. It is the best GO-TO gift for anyone you want to share God’s love with. 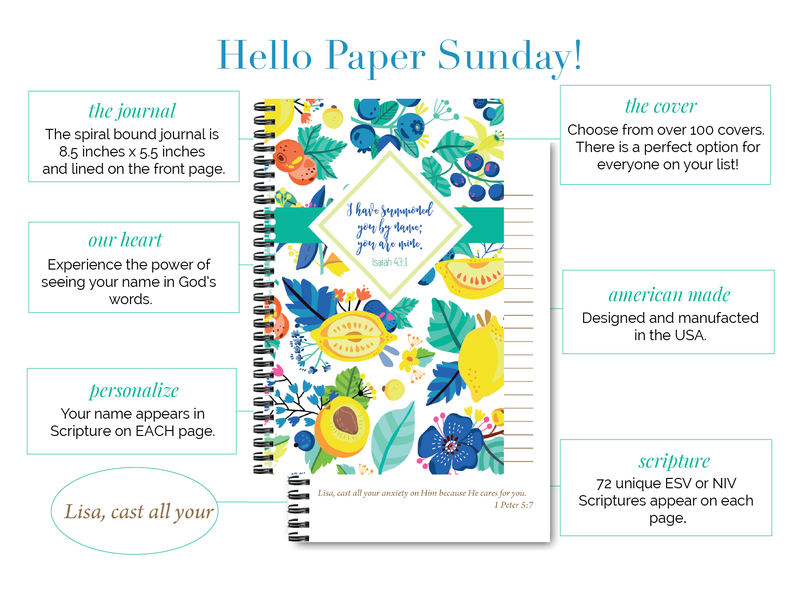 Our heart is simply this: as you journey through the pages of your Paper Sunday personalized Scripture journal, we hope you would have a new revelation of just how personal he is. Whether you are in a season of great joy or struggling through your darkest hour, there is one constant: the love of God. My prayer is that your personalized Scripture journal would encourage, inspire, teach and fill you with hope as you are drawn to his word and drawn to him in a deeply personal way. May you have the power to understand, as all God’s people should, how wide, how long, how high, and how deep His love is for you (Ephesians 3:18). Enter below to win your own personalized journal from our friends at Paper Sunday! And don’t miss Paper Sunday’s Easter discount! Enter the code EASTER at checkout for 15% off your entire order. Kara Heckel started Paper Sunday over 10 years ago in the hopes that more people would choose relationship over religion, and understand how personal God really is! She lives in Dallas, Texas with her husband and two boys ages 5 and 3. They attend the Village Church and in addition to loving Jesus she loves chips and queso, lake time with her family, flip flops, and ponytails!